I hate to throw things out if I can make them usable again. Take the lowly kitchen sponge. Not much in your home gets as stinky or germy, as that sponge except for maybe the trashcan and the garbage disposal. Not even the toilet has as many bacteria. 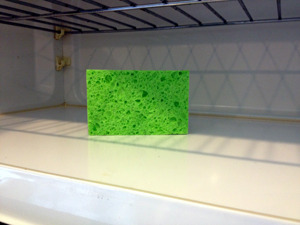 A kitchen sponge is moist and full of little crevices where bacteria can make their homes. With just a couple days use, a sponge can harbor millions of harmful molds, yeasts, and foodborne pathogens, no matter how well we rinse them out. And then we take that nasty thing and smoosh those germs all over our kitchen counters and dishes. And dangerous. While we think we are cleaning, that sponge is also spreading things like salmonella and e coli around the places we prepare and eat food. Sponges cost all of about fifty cents each, so why not just toss it in the garbage when it starts to stink? Because in order to be safe, you’d have to use a brand new sponge every two to three days. At about $.50 a pop, that could get expensive. You could use a dishrag, but it’s no better germ-wise unless you launder it daily. And paper towels, while safer, would also get expensive. But there’s good news! You can kill 99.99999% the germs in your sponge and make it smell fresh again in about two minutes! And there you have a nice, fresh kitchen sponge. You’ve saved $.50 quicker than cutting out a coupon for new sponges, and maybe saved your family from a case of food poisoning. 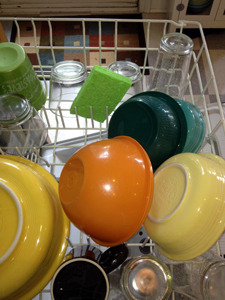 Another way to clean your sponge is to put it in the top rack of the dishwasher when you run it. This works just as well as using the microwave, but only if you have the drying cycle turned on. The drawback to this method is that it usually takes me 10 minutes of looking for the sponge the next morning to remember I put it in the dishwasher. I used to soak my kitchen sponge it in a little bleach and water for a few minutes. This refreshes the sponge, but according to the USDA, it kills the germs about as effectively as just letting the sponge dry out, which is not very well at all. And if you are like me, well, let’s just say I’d better be wearing all white and move my colorful kitchen towels to another room before I pour the bleach. 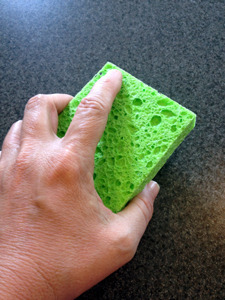 Sanitize your sponge in the microwave or dishwasher as part of your regular kitchen cleaning routine everyday (or at most every two or three days), and you will keep your family safe by disarming the most hazardous bacteria spreader in your home. You’ll also save money, because your sponges will stay fresh and last a lot longer.